Compute the Discrete Prolate Spheroidal Sequences (DPSS). 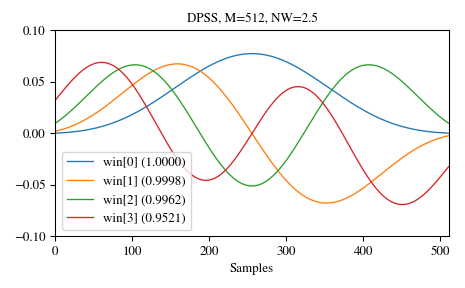 DPSS (or Slepian sequencies) are often used in multitaper power spectral density estimation (see ). The first window in the sequence can be used to maximize the energy concentration in the main lobe, and is also called the Slepian window. Standardized half bandwidth corresponding to 2*NW = BW/f0 = BW*N*dt where dt is taken as 1. Number of DPSS windows to return (orders 0 through Kmax-1). If None (default), return only a single window of shape (M,) instead of an array of windows of shape (Kmax, M). If ‘approximate’ or ‘subsample’, then the windows are normalized by the maximum, and a correction scale-factor for even-length windows is applied either using M**2/(M**2+NW) (“approximate”) or a FFT-based subsample shift (“subsample”), see Notes for details. If None, then “approximate” is used when Kmax=None and 2 otherwise (which uses the l2 norm). If True, also return the concentration ratios in addition to the windows. The DPSS windows. Will be 1D if Kmax is None. The concentration ratios for the windows. Only returned if return_ratios evaluates to True. Will be 0D if Kmax is None. This computation uses the tridiagonal eigenvector formulation given in . The default normalization for Kmax=None, i.e. window-generation mode, simply using the l-infinity norm would create a window with two unity values, which creates slight normalization differences between even and odd orders. 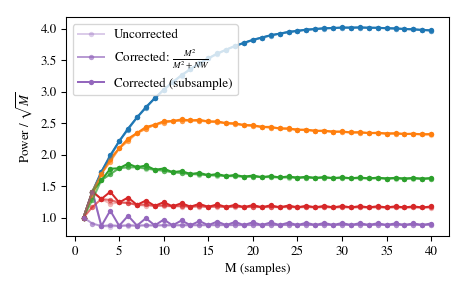 The approximate correction of M**2/float(M**2+NW) for even sample numbers is used to counteract this effect (see Examples below). For very long signals (e.g., 1e6 elements), it can be useful to compute windows orders of magnitude shorter and use interpolation (e.g., scipy.interpolate.interp1d) to obtain tapers of length M, but this in general will not preserve orthogonality between the tapers. (1, 2) Percival DB, Walden WT. Spectral Analysis for Physical Applications: Multitaper and Conventional Univariate Techniques. Cambridge University Press; 1993. 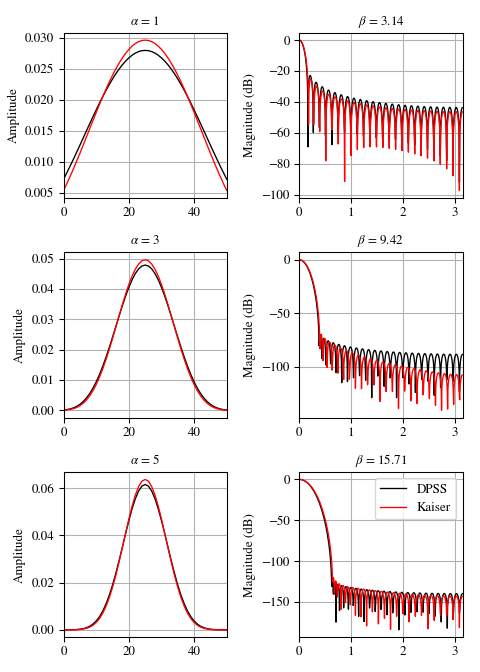 (1, 2) Slepian, D. Prolate spheroidal wave functions, Fourier analysis, and uncertainty V: The discrete case. Bell System Technical Journal, Volume 57 (1978), 1371430. (1, 2) Kaiser, JF, Schafer RW. On the Use of the I0-Sinh Window for Spectrum Analysis. IEEE Transactions on Acoustics, Speech and Signal Processing. ASSP-28 (1): 105-107; 1980.